With a wide range of ages, the 16 women and men of RAH come from different parts of the country and all walks of life but have one thing in common: a lot of bell ringing. Combined, the group has well over 300 years of ringing experience—many who’ve been ringing since childhood—not to mention those with directing experience. Many also sing or play other instruments with groups in the community in addition to handbells. Now in its second year, RAH is expanding its repertoire with a full new set of pieces and putting an emphasis on production and showmanship—bells are a visual experience just as much as an auditory one. The fall/winter season will include a number of shows centered on a “Colors of Christmas” theme, with music ranging from “Greensleeves” to “Blue Christmas.” The season culminates with a free concert at the Rochester Public Library December 9. 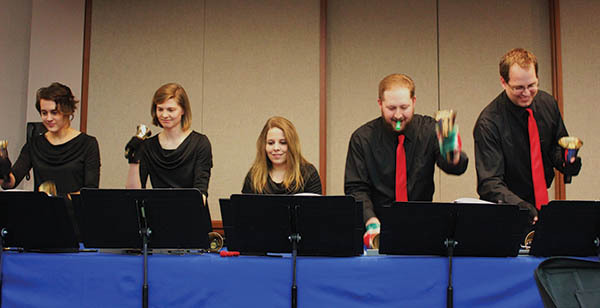 There’s really nothing like timeless favorites played by a set of handbells to set the tone for the holiday season. Visit rochesterareahandbells.org for more dates and times. All are welcome, and attendees are encouraged to ask questions and give the bells a try after the show. Come ring in the holidays with us! Jen Jacobson is a writer, editor and proud founding member of Rochester Area Handbells.